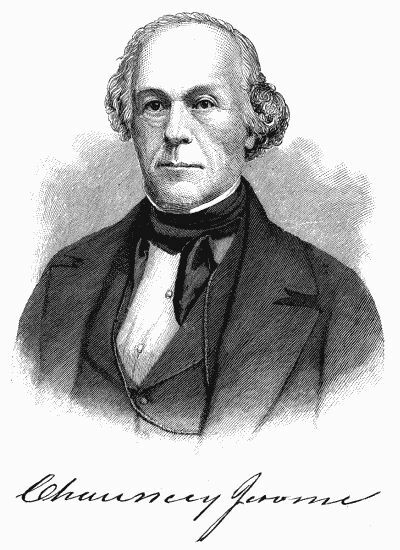 Chauncey Jerome had the good fortune to be born in 1793 in an area of the United States already populated with talented clockmakers like Eli Terry and Seth Thomas. In 1793 Eli Terry had already served his apprenticeship and, at the age of 21, had just opened his clock shop in Plymouth, Connecticut. When Chauncey was 10 years old, Seth Thomas was joining Eli Terry in the production of clocks using Terry’s innovative concepts of powered machinery and standardized parts for the previously custom made wooden works for clocks. Chauncey's father was a blacksmith and nail-maker in Waterbury, Connecticut, the same Waterbury that became famous for the Waterbury Clock Company. Chauncey applied his metalworking background to the manufacture of clock dials for tallcase (grandfather) clocks of the era. 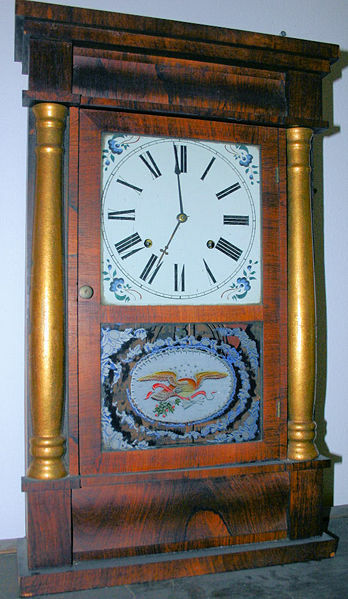 He moved to New Jersey to learn about making clock cases but returned to Connecticut in 1816. Meanwhile in 1815 Eli Terry invented the wooden shelf clock; until then all American clocks were tallcase clocks. In 1816 Eli Terry hired Chauncey Jerome to build shelf clock cases where Jerome learned about automation and assembly line methods from Eli Terry. Chauncey Jerome the entrepreneur established his own business shortly thereafter, first making cases for Eli Terry. In 1822 Chauncey Jerome and his brother Noble opened a clockmaking shop in Bristol, Connecticut. They began manufacturing clocks made from his cases and Terry’s clock works. Fifteen years later Chauncey Jerome was the most successful clockmaker in the area. Meanwhile American clock technology changed from wooden to brass clockworks, and, unlike Seth Thomas who continued to make wooden works until brass works were completely accepted by the public, Jerome readily adopted brass works. Chauncey Jerome, in fact, sold brass clockworks to other clock makers. It has been said for many years that Jerome was the man responsible for the introduction of the cheap brass clock movement that put clocks within the reach of most Americans for the first time. This statement can be debated however. But even if not entirely true, by his being such a good businessman and promoter, it was the common feeling at the time. Jerome did not have the ability to produce his new cheap brass clock on his own. Remember, he was a trained clock cabinet maker. His brother, Nobel was a trained clockmaker, and applied for the patent for the new movement. The patent was granted on June 27, 1839. These new clock movements were put in Ogee cases and sold under the names C & N Jerome, Jeromes & Company, and Jerome, Grant, Gilbert & Company. Jerome’s business prospered enough that he opened a new facility in New Haven, Connecticut in 1842 devoted to the production of clock cases. Like many other clock companies of the era, Jerome’s manufacturing plant in Bristol was destroyed by fire. He then consolidated all manufacturing operations in New Haven, producing about 150,000 clocks per year. Chauncey Jerome, the entrepreneur, had devised a way of stamping rather than casting brass clock components and was able to manufacture low-priced clocks for domestic and overseas markets. Other Connecticut clockmakers soon saw the potential in Jeromes cheap brass clocks and began adopting them in their own factories. Even Seth Thomas , who was usually reluctant to change his proven methods of manufacturing, finally saw the writing on the wall and started producing the brass movements. Clock companies in Connecticut relied on local brass production and in 1850 Jerome partnered with a brass company in Waterbury, Connecticut to form the Jerome Manufacturing Company. Three years later the company became the well-known New Haven Clock Company , which produced over 400,000 clocks per year. However, Chauncey Jerome the entrepreneur expanded one time too many when in 1855 he purchased a clock company in financial trouble in Bridgeport, Connecticut. This move eventually left Chauncey bankrupt. Without assets to form a new company, Chauncey worked at odd jobs and occasionally at other clocks companies. He died penniless in 1868 at the age of 74.